Screen shots were taken from Jack Orlando: A Cinematic Adventure by Topware Interactivehttp://www.topware.com. Only the necessary actions to end the game are mentioned in this walkthrough. You can pick up a lot of items in this game, but most of them aren't useful. I disregard some locations too, for they aren't essential. Between brackets I will give the order of the dialogue options. 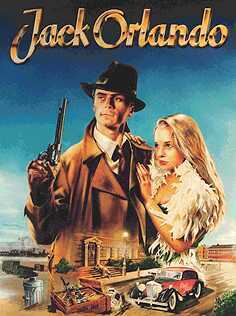 Jack Orlando walkthrough © 1998 by Willem van der Velden. All commercial rights reserved. This document may be distributed, so long as no content is changed and no fee is charged. The story starts in an alley, where you were knocked down. Next to you lies a dead man, Major Pete Reynolds. When the cops arrive, you may use dialogue options "1,2,3,2,1" and they will let you go to prove your innocence (you will get 48 hrs). If you choose (2,2) one will take you to the police station. In the cell you will meet Bernardo (3,2,2). Use the fist-icon on him and he will give you a name, Don Scaletti, the boss of organized crime in town. Use the fist-icon on the door and talk to the inspector Tom Rogers (4,1,2,2). After this you will be brought back to your apartment. Your key is under the carpet. When you open the door, your neighbor Alice appears (4,1). Go into your apartment and go left to have a wash and brush-up. Get your wallet from the couch. Open left drawer in bookcase to get key. 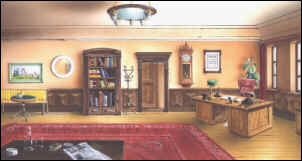 Take the brush at the left of the bookcase and use the key on the cabinet to the right to get your Colt. Go to Alice's apartment. Talk to her (3,2) and give her the brush. Take boxing gloves from the wall and leave. Pick up broom in the hall. Visit the crime scene in the alley. Note the blood stains and pick up the remainder of the Davildoff cigar. Notice the ladder (the broom will not do to get it down). Leave the alley and go to the end of the second alley. Talk to the old woman. She will tell you the car is from Biff, who hates people (don't take the crank from the car for Bill will knock you down. Your can't use your boxing gloves yet). Leave the alley, cross the street and take the street next to the schoeshiner. Use the broom to get the horseshoe from under the horse. Combine it with the boxing gloves. Go back to the alley and take the crank. This time you will succeed. Go to the other alley and use the crank on the ladder. At the roof find the matches from Night O'Cranis. In the alley you will meet the inspector again, who will give you your car keys. Use your car to go to the town centre. You will arrive at the Cotton Club (you can't go in and dance in this game). Talk to the man at the corner (1,1). Use the fist-icon on him and he will tell you that there's a casino in the back of the restaurant. Go to the other side of the street to visit Charles' shop. Talk to him (1,2,2,3,2,1). He will give you five dollars and you may take a newspaper (Today's News). Go out and walk towards the end of the street. Across the street you will find the club Night O'Cranis (if you talk to the taxi driver, he will tell you that Frank will repair cars for whiskey). Talk to the girl (2,2,3). Talk to the porter (1,1) and receive a nice blow with his fist. That's not the way to get in. Walk into the direction of the Cotton Club (north) and take the first alley to the left. Go right and climb the ladder. Take the back entrance and open the second door to get into the club. Talk to the girl at the bar (2,2,2,3). Give her five dollars and she will tell you that the man who smokes Davildoff cigars is August Bellinger, who is staying at the Paradise Hotel. Talk to the receptionist (2,2). He will tell you Bellinger stays in room 101. Go to the right, look at the door where the cleaning lady has left her keys. Back to the lift and upstairs. Bellinger's room is opposite to the lift entrance. Go in and be quick (otherwise Bellinger will arrive and shoot you). Look under the bed and at the notebook on the cupboard. Now you have an appointment at Night O'Cranis at 20.15 hrs with mr. Smith, using Today's news as your identification. Use the window to exit. Talk to the vagrant Jerry Cooper (2,3) He will tell you that you can get cheap whiskey at the old factory. Go back to the street and use fist-icon on planks of the green condemned house. Enter first room to the right and take baseball bat. Exit and take the second room to the left. Click on sleeping vagrant (1,1). Take the rope next to him on the floor. Smith is waiting at a table. Show him Today's News (3,2). Outside, hit Smith with your Colt (gun) when he turns his back to you. Tie him with the rope (if you don't do this, he will betray you at the casino and you will be shot). Go back in, Bellinger has arrived. Show him the paper (2). You agree to continue the conversation at the Cotton Club, but Bellinger will be shot and killed. When the police arrive (3,2,1) and one cop lets you stand alone to wait for the inspector, go two screens to the south, then return to the Cotton Club. Go to the crossing, go right and continue down this street past the Old Whiskey Factory, past a truck and past a drunk to Frank's Garage. Before entering, go to the right and remove the sheet from the blue car, then get an entrance ticket to the casino from the car. Now enter the garage and talk to Frank and tell him that you hope his fixing your car won't be too expensive. Go to the casino (opposite of Night O'Cranis). Show your entrance ticket to the guard. Talk to the girl at the right (3,1,3,2,3,3). 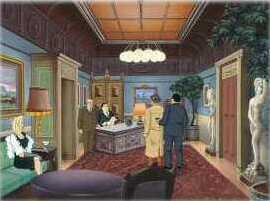 Pestering her will trigger the guard to come (1,1) and he will take you to Scaletti's office. Talk to Scaletti (1,3,1). During the conversation you will hear about a meeting at the pier. The guard will lock you up, but Scaletti's daughter, who wanted to marry Bellinger, will help you and give you a crowbar for your escape. Use it on the door and go back to Scalletti's place to take the papers on his desk. Go out the same way you came in and go through the door at the end of the hall. To get rid of another guard, use the valve at the left side of the door. Pick up the bullets. Go to the right and use your Colt on the lock at the door. Go back to the Cotton Club. Go to the crossing , go right and open the second door into the alley of the old whiskey factory. Get the crank on the crate and use it to start the truck. Go inside and take the whiskey bottle. Return to Frank's garage to get your car. Go inside the garage and give Frank the bottle of whiskey. Now go outside and take your car. Go to the alley and pick up coin. Go back to your car and go to the left to enter the Bloody Shark. Talk to the sailor (4,1). Talk to bartender (4) and give him the coin to get a drink. Give beer to the sailor and take his sausage. Go out and enter other alley (at the other side of the street). At the end of the alley, feed sausage to the dog and pick up metal cutter. Go back to the first alley and use the cutter on the lock of the green door. Enter, but go out again (shortcut). Go back to the alley where you saw the vagrant and steal his bottle. Now enter the harbor again. Watch out, there's a guard. When you see him appearing in the north, follow him (left, left). You will see the door to the warehouse. Go left again (crane location). Take the second passage (top left) between the crates and go north. Go north east (small passage between the crates). Step to the north and three guys will appear that will attack you. After the dialogue (1,1), use Colt on them. Pick up the crowbar that one of them has dropped and use it on the loose plank to the left. Pick it up and go left. Now go north and use the plank on the boat. Inside, pick up anchor. Go back to the crane-location, now go to the left. Talk to the fisherman (3,2,3) and give him the bottle. Pick up rope and combine it with the anchor. Go back to the crane location (Save. You may have to wait a little until the guard has gone). Go right and use hand-icon on door. Go up and then to the right. After the dialogue, pull lever of the ventilator in the middle of the screen. Go right and climb ladder. Use Colt on guard on the roof, then use anchor and rope to get on the top of the truck below. Talk to the soldier (4,3). Go inside and enter the first door to your left. Talk to soldier (2,1,1). Connect telephone outlet with board and make your call to Tom Rogers (4,2). Go outside and open door at the end of the hall. Talk to major Stewart (1,1,1). Go out and open the last door to the left. Talk to the girl (3,1,2). Go back to Major Stewart's office and go left. Talk to the colonel (2,2,2,3). Tom Rogers and Major Stewart will come in, but two MP's will arrest them. End sequence follows.